The view from the Symi Visitor Accommodation office this morning. 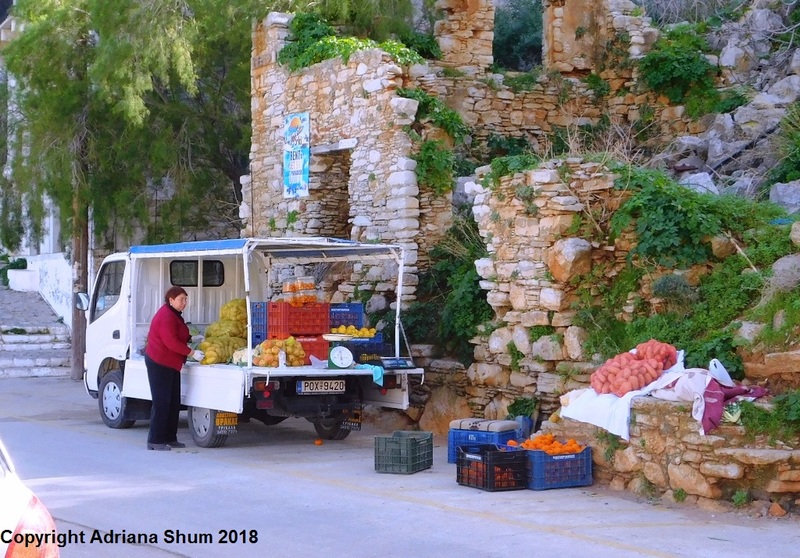 Yes, we do get fresh cauliflowers and celery on Symi. They are winter crops in this part of the world. No one has to teach the Greeks to eat in season - they always have done. It has only been relatively recently that we have been able to reliably buy tomatoes, cucumbers and aubergines in the winter. They come from poly tunnels in Rhodes and Crete. The usual Greek salad in tavernas in the winter is actually a green salad based on Kos lettuce and various wild greens and herbs not available in the summer. 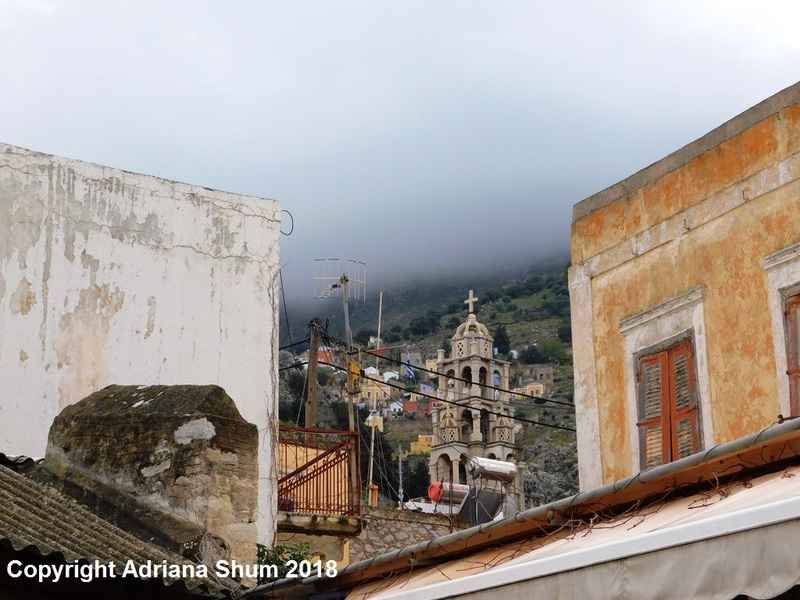 Low cloud rolling down the Vigla warns of more rain to come. 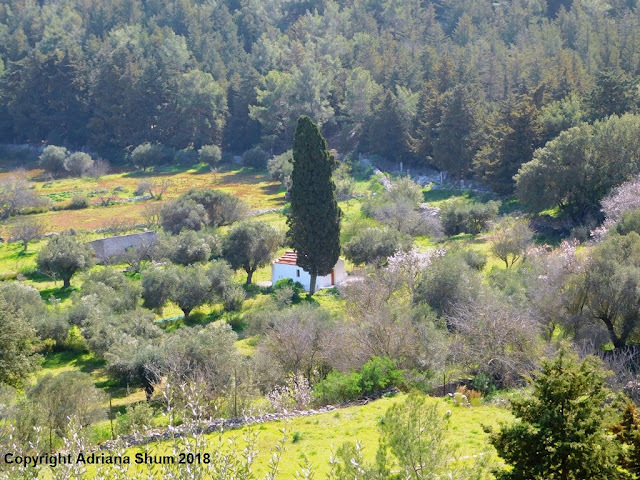 That is the bell tower of St John's church in Yialos. 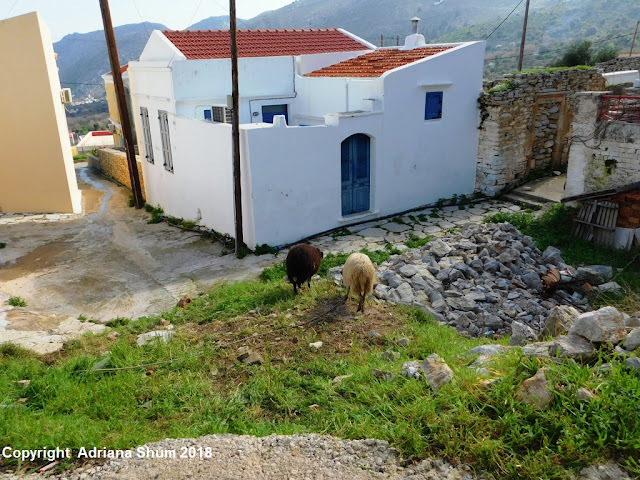 The buildings on the hill behind are in one of the oldest parts of upper Chorio, dating back to when the donkey path up the Kataraktis was the main route up to the village. The view from the bridge in Yialos. The water level is very low due to a barometric high over the area. 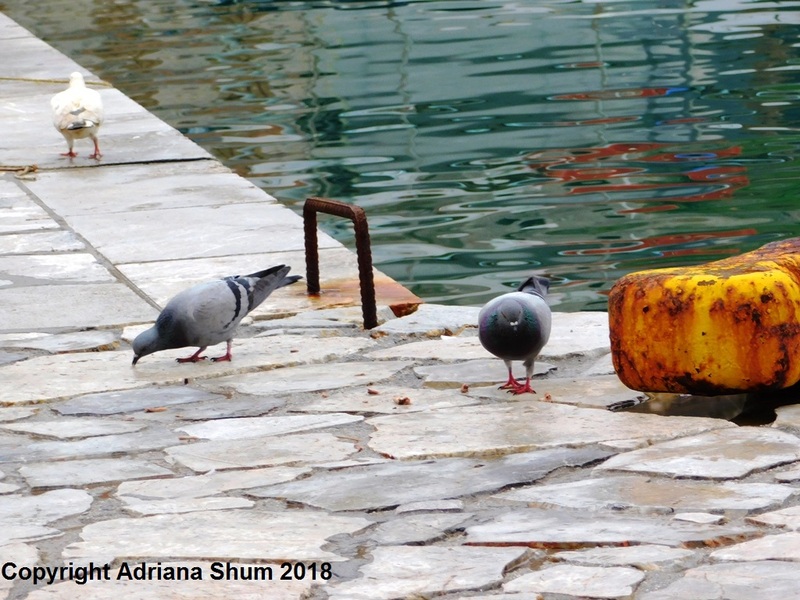 The water, which used to be very clear, is still discoloured by all the soil that washed into the harbour in the flood on 13 November 2017. At least the sunken boats and wrecked cars have all been removed. There are still odd chair legs and bits of bicycle sticking out of the silt though. Further up, in the upper parts of Chorio around Stavros Church, work has not even begun on rebuilding the destruction that the torrents caused and for many Symiots and expat residents it will be a long time before life returns to normal.. The Pedi valley and the football pitch are still awaiting attention too. The slip by the customs house this morning. With the low water level today this marvellous green carpet of weed has been revealed. No doubt incredibly slippery. 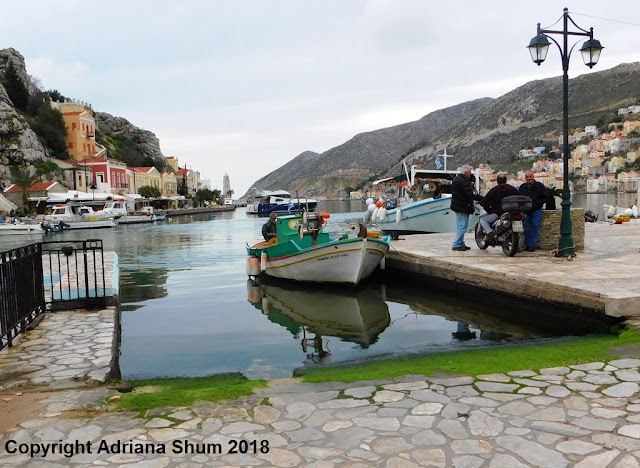 As you may have gathered, there isn't much for men to do on Symi in the winter except fish or chat to friends who are fishermen. 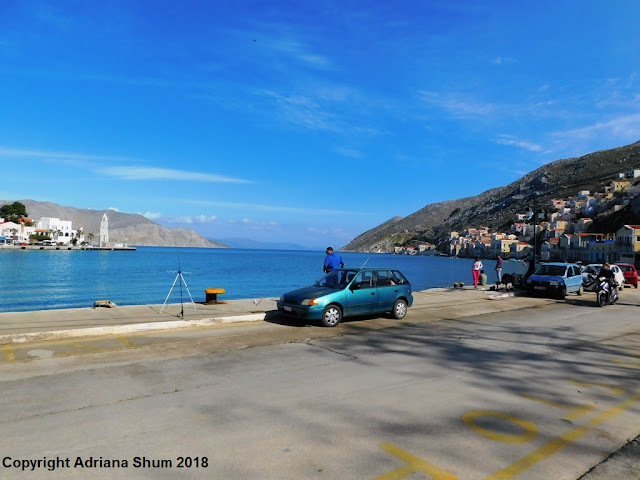 In the summer those blue booths are the ticket counters for the water taxis to the beaches. One can always feed the pigeons. Symi is a very vertical sort of place. 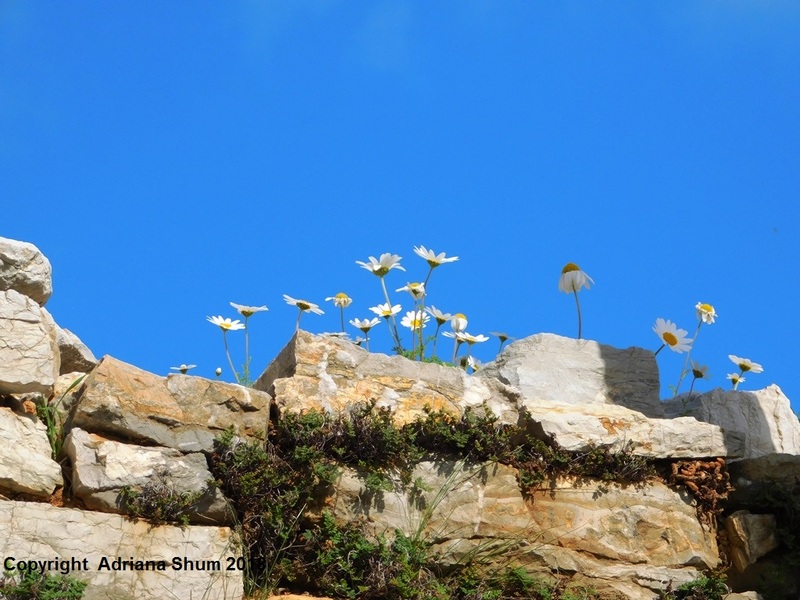 The steep slopes of the amphitheatre harbour look like a hanging garden. 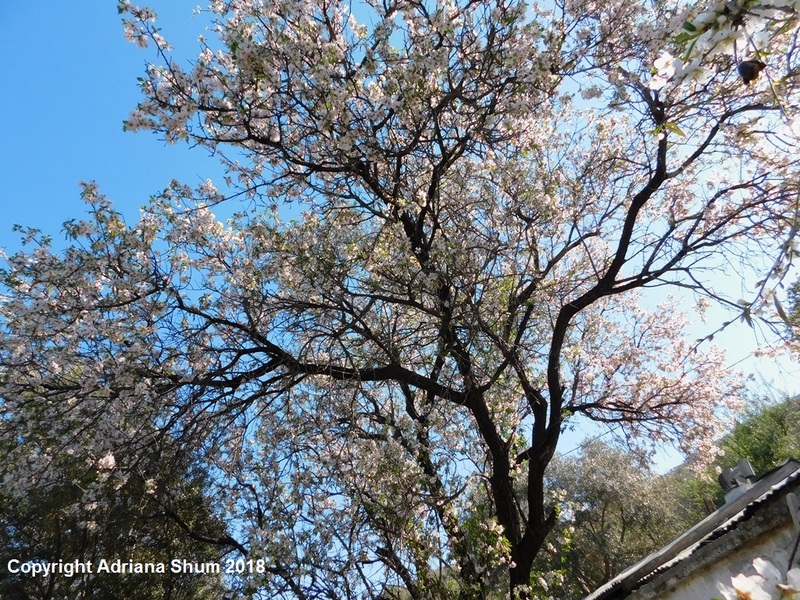 That is an almond tree among the conifers, unfurling its spring greenery as the blossom falls. Lemonitissa church on the Kastro overshadows Pallas Athena on one of the island's oldest jewellery shops. Houses on Symi are generally not very big but even by Symi standards this one is exceptionally narrow. I sometimes what what the story is behind it. 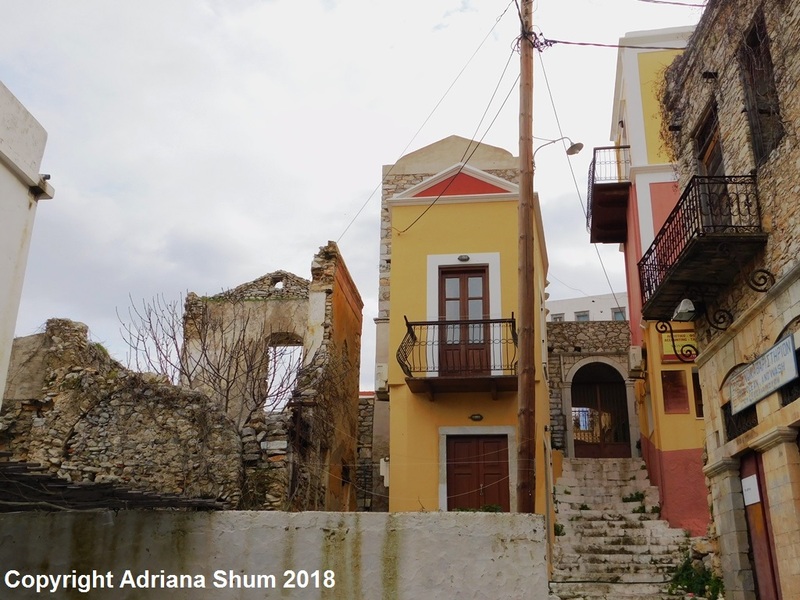 It is very surrounded by what were commercial properties in the island's commercial boom period at the end of the 19th century. The boutique hotel, the Old Markets, is just up those steps to the right and is tucked behind the buildings to left and right. That archway you can see was the old covered souk. 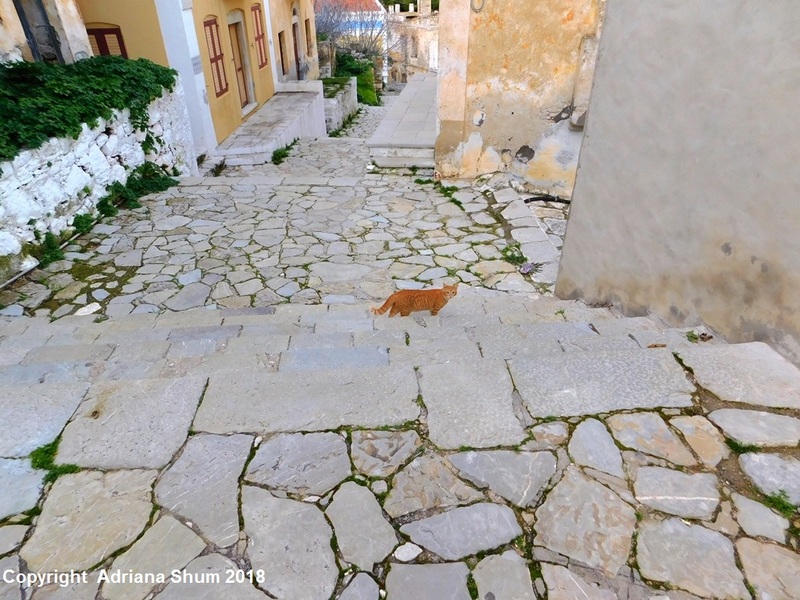 If you continue up to the right you are on the historic Kali Strata steps. 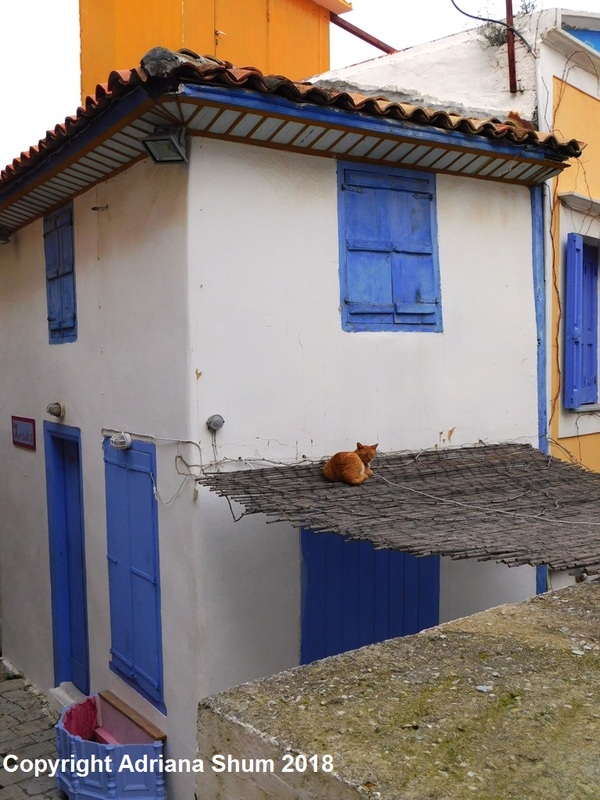 Another small but intriguing building at the bottom of the Kali Strata houses the Krysallis boutique in the summer. The cats snooze on the bamboo all year round. Looking through the ruins of one of the old mansions on the Kali Strata at the steep hillside that forms the other side of Symi's famous amphitheatre harbour. 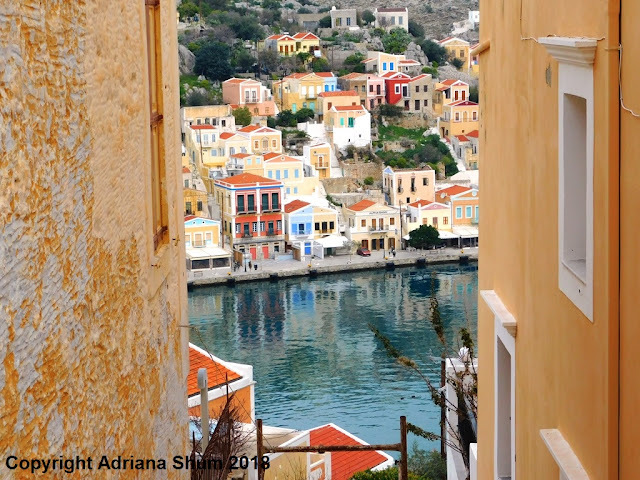 In the summer Symi's waterfront bustles with shops, cafes, bars, tavernas, yachts and gulets. In the quiet weeks of winter there is little to disturb the peace except the weather and an occasional passing ferry. A stray Kos lettuce sprouting between the flag stones on the Kali Strata. 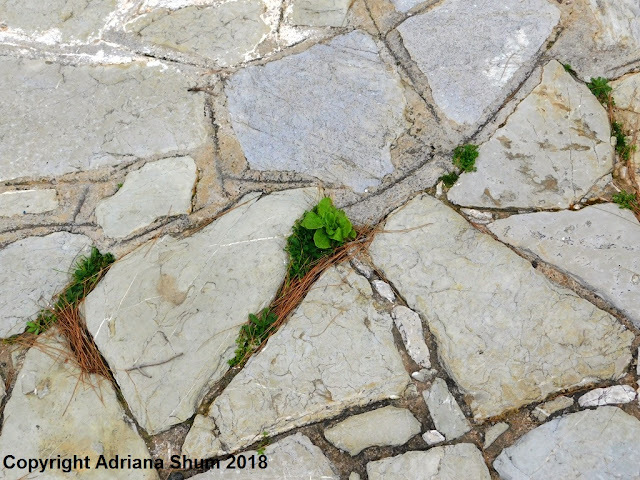 There is not much point in spending many man hours weeding the old paving stones until the rain has passed and the first tourists arrive sometime in April. 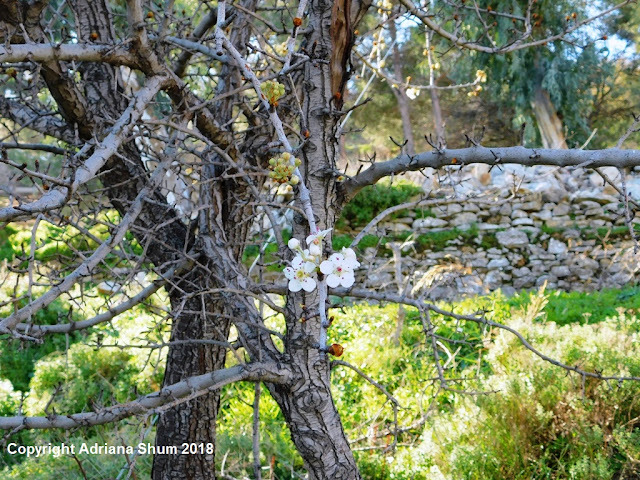 At this time of the year the stuff grows before your eyes. 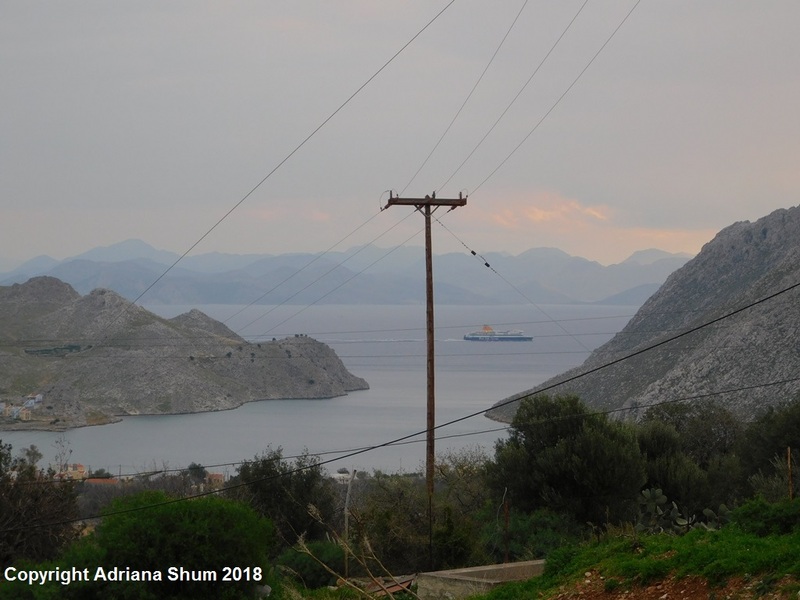 The view of Yialos, Harani and Nimos from my favourite look out spot at the bend in the Kali Strata. The calm before the storm. We have a week of rain and thunderstorms ahead of us. 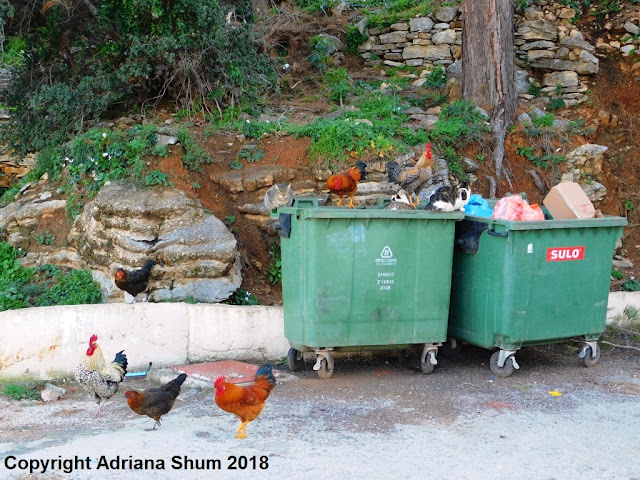 Up in the wilds of Lieni the free range poultry and feral cats live in happy co-existence, sharing the spoils of the skip on the corner between them. There seems to be a serious preponderance of cockerels hanging out. 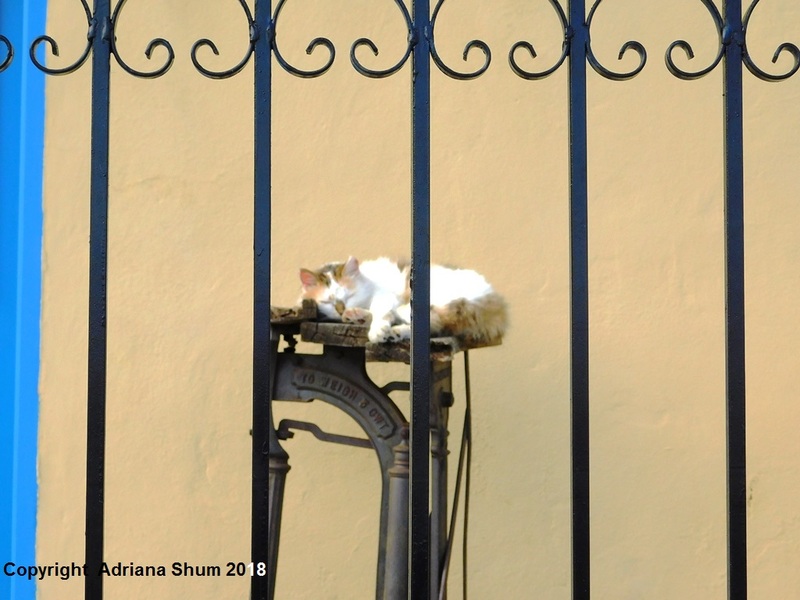 By the way, although this is quite a busy road and a fairly dangerous corner, everyone slows down to let the cats and chickens meander across the road at whim. 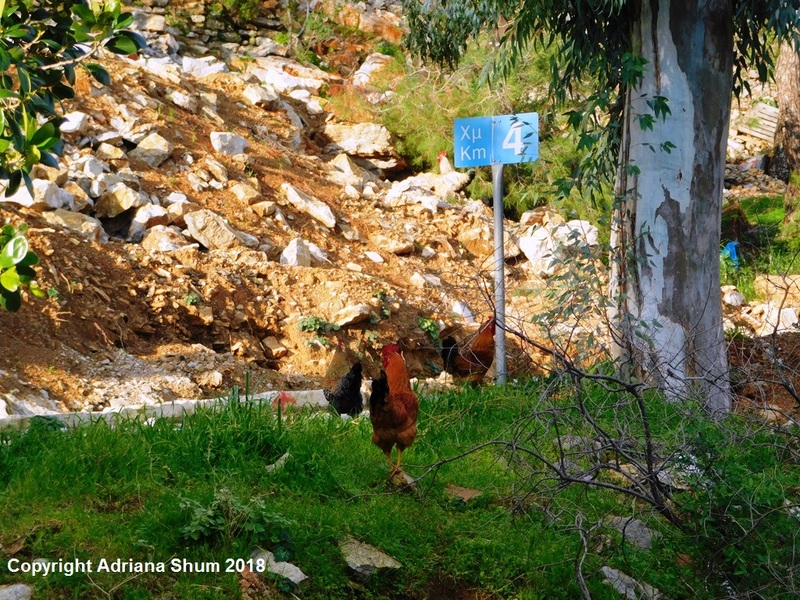 The poultry have their roost in a scrubby bush on the other side of the road so a fair amount of 'chicken crossing road' goes on, as you may imagine. Wild cyclamens are everywhere now, scenting the air with a very delicate fragrance. 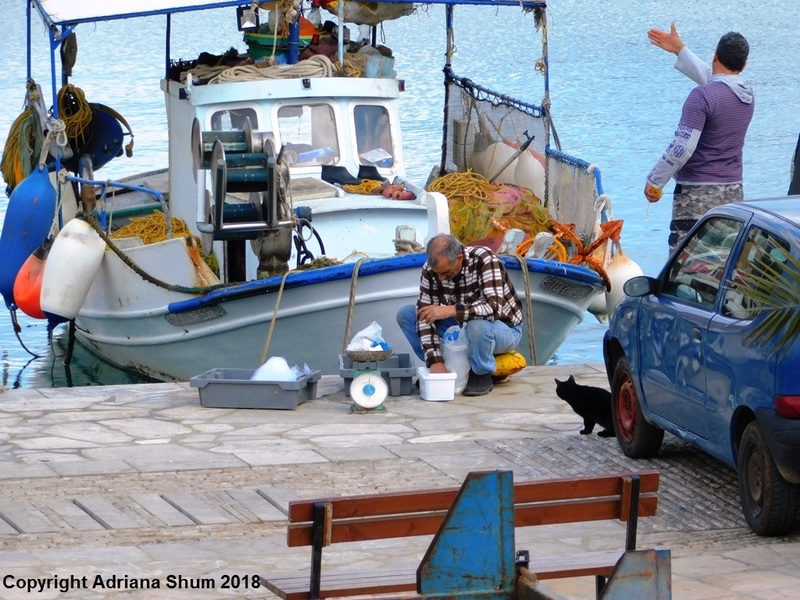 Fresh fish on the quay. Almond blossom - before yesterday's hail turned it all into confetti. 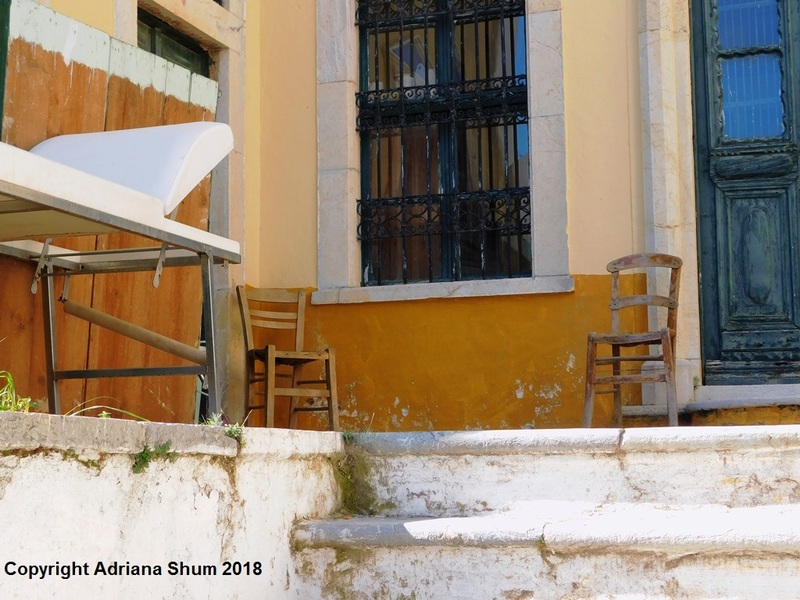 The old Pharmacy in Chorio served as the Chorio clinic for a few years in the late 90s, hence the old examination couch. The building is now being restored. 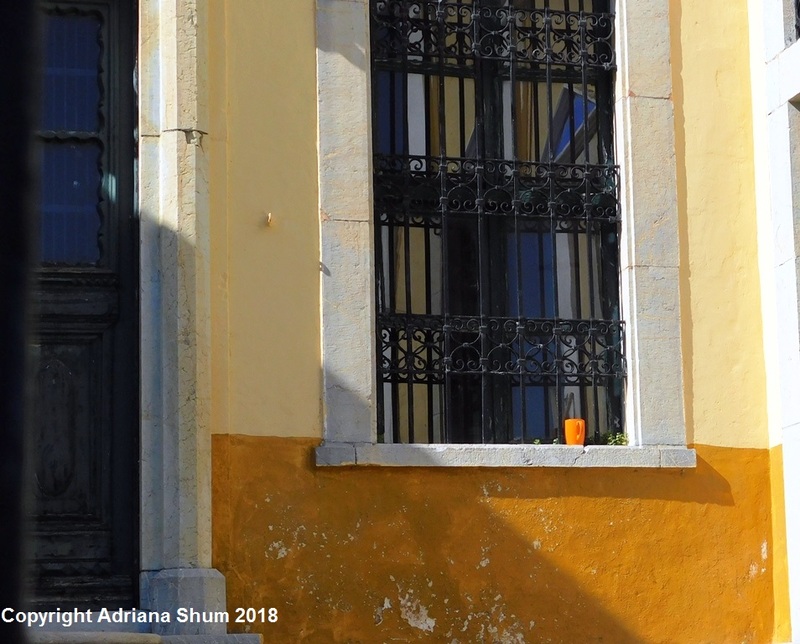 If you ever see it open, there are some amazing old bottles and jars from its old life as an apothecary, when pharmacists had to mix their own potions and pills. After an extremely short winter break the Valonia oak in Lieni is already covered in buds and new leaves. A clear indication that temperatures are far warmer this year than usual for February. 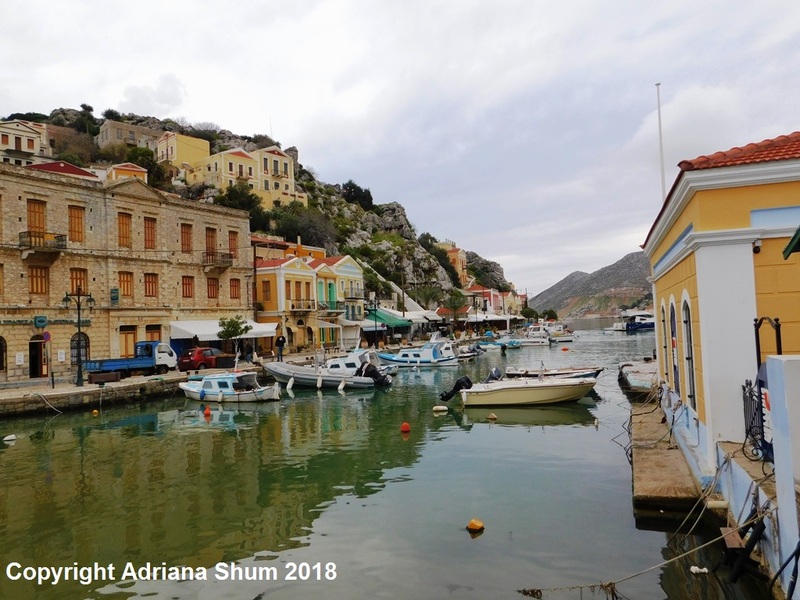 It has been very wet on Symi these past two days and this morning when I left I did not want to risk bringing my camera down in case it got wet so I just brought the card down to see what I had. You see it above! The rain is expected to continue until tonight. The weather should be dry for the weekend including Clean Monday, with more rain expected to move in again on Tuesday. I shall be back with more photographs for you on Tuesday. Have a good weekend - and happy carnival to all of you who are celebrating this weekend. Friday midday in Yialos and there wasn\t much happening apart from a handful of locals fishing for their dinner. Painting taverna tables outside Pantelis, a popular waterfront seafood taverna. 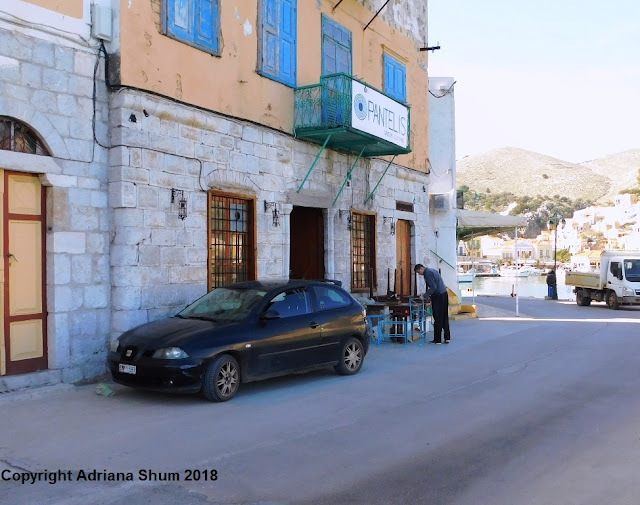 The seasonal nature of Symi's tavernas and restaurants ensures that at least once a year everything is stripped away, cleaned from top to bottom, repainted, repaired and replaced if necessary. 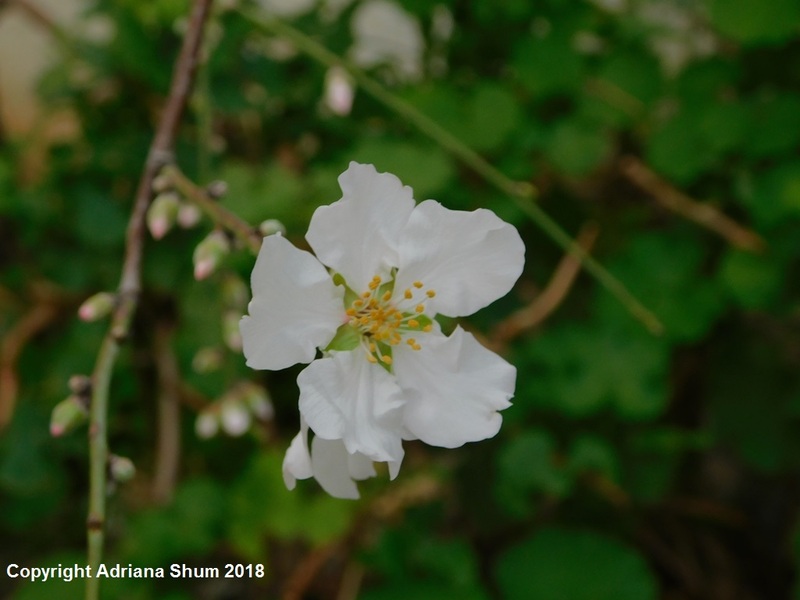 The traditional months for spring cleaning and preparation for the season are March and April, once the winter storms are over. Once a week, very early on a Friday morning, there is a direct connection between Tilos and Symi on the Blue Star. 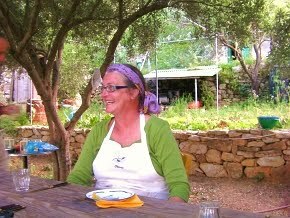 This woman comes over then to sell her fruit and vegetables, returning on the Blue Star late at night. Tilos is about 2 hours away from Symi on the ferry and, unlike Symi, has abundant water and rich fertile soil. It has a permanent population of only a few hundred people and is very isolated, even in the summer. Every few years the Ministry of Random Signposts hits Symi with a spate of vaguely incomprehensible signposts. The last lot included one to the Ruins of Old Drakos which directed walkers into the bottom of my garden. 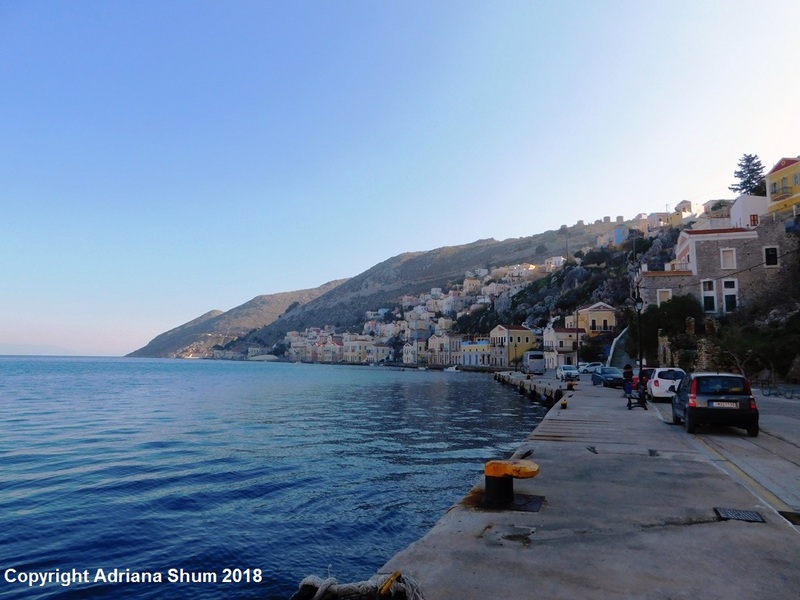 This time we have acquired a new Symi destination, Palia Poli. 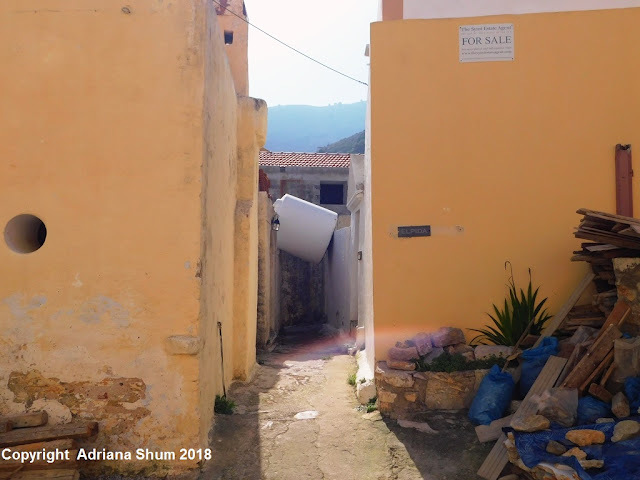 This literally means old town, better known as Chorio (the village) to the rest of us. While you may eventually hit the Kali Strata by dragging your suitcase up this ramp and then dithering between the steep steps directly to the high school or the not quite so steep steps to the school playing field, you will actually have missed most of it as you will arrive at the top of the Kali Strata, not the bottom. A sign post marking the start of the Kali Strata which is behind Bella Napoli and the Vapori Bar in the back corner of the harbour would be much more sensible - not to mention beneficial to people looking for the Old Markets hotel or the Krysallis boutique. 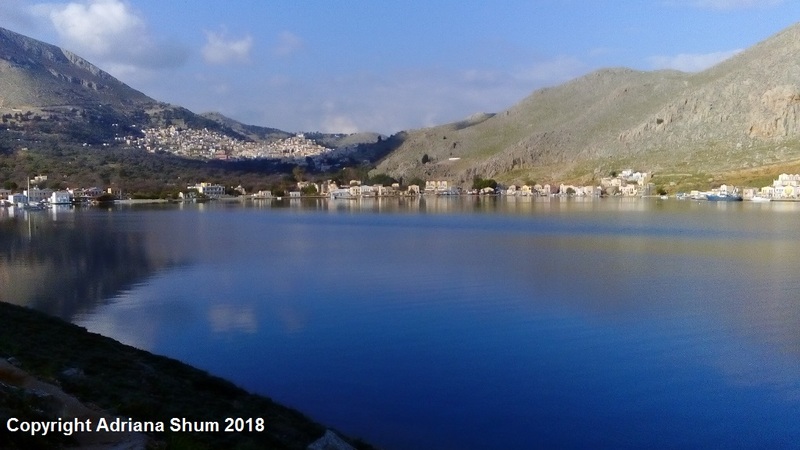 Sunday was bright and clear, if a little windy, and we drove up the mountain to see how the rest of Symi was faring. 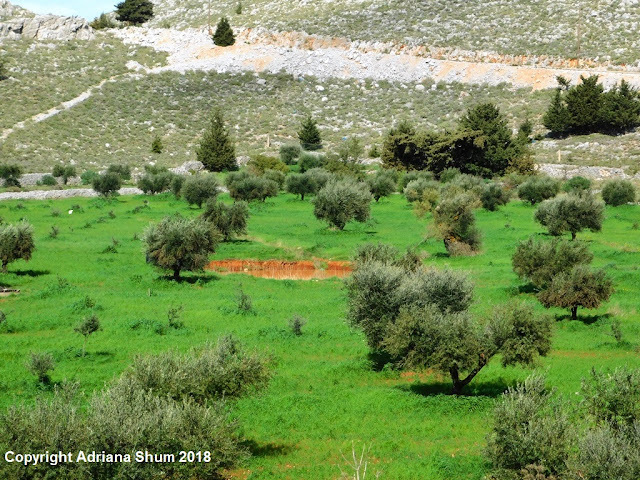 This is one of the hidden valleys above the descent to Panormitis. There aren't many ponds on Symi but those that there are are full after the heavy rains of November, December and January. Yes, this is on Symi! 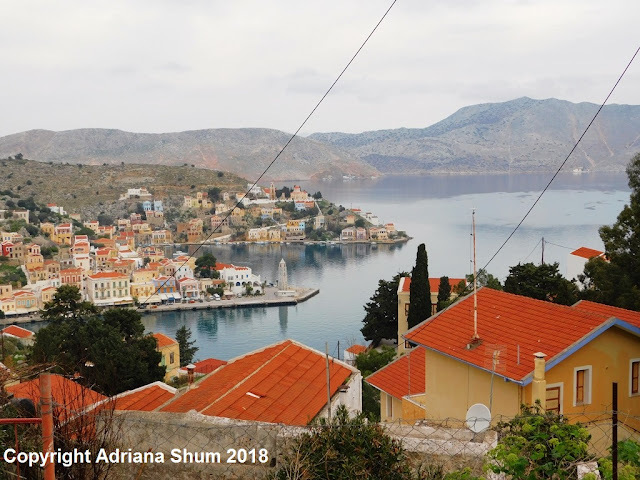 It is carnival season in Greece, although you would not think so here on Symi where life continues at its usual snail's pace. Only the occasional bedraggled streamer in a gutter or fleeting glimpse of a child in fancy dress gives a clue to what used to be a very boisterous and fun-filled time of the year on the island. 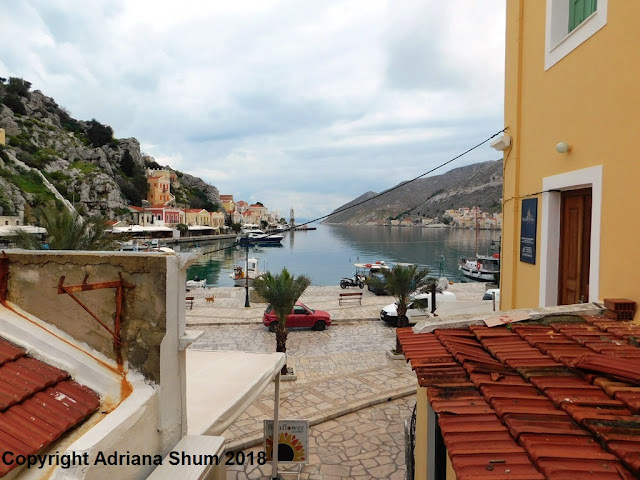 The mood on Symi has been very subdued since Storm Eurydice hit the island on 13 November last year. The economic losses suffered by many households and businesses at a time when there is little spare cash around will have a lasting impact. 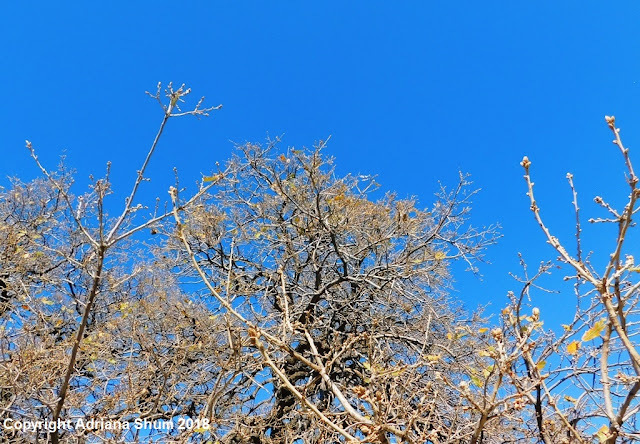 Nature, having caused so much havoc, now teases us with temperatures well above seasonal averages and weather that is only consistent in its inconsistency. Showers, squalls, bright sunshine, downpours - February is the new April. While Western Europe struggles with snow and bitter cold, the other side of the continent is experiencing a premature spring that is just as unusual. Heavy rain is forecast for Wednesday, Thursday and Friday. 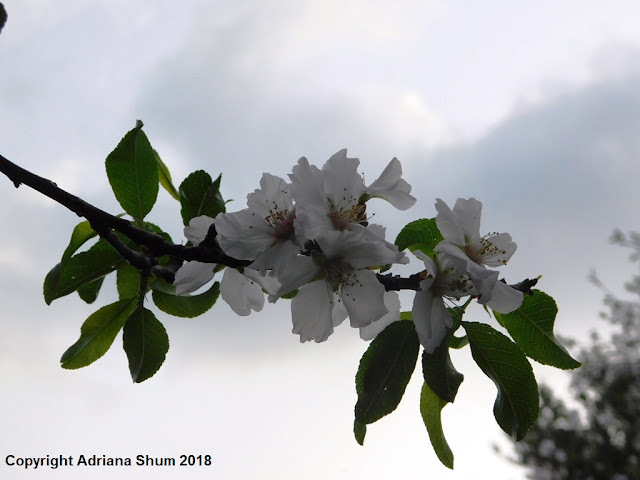 The rain showers we had this morning, however, did not appear on any forecast. 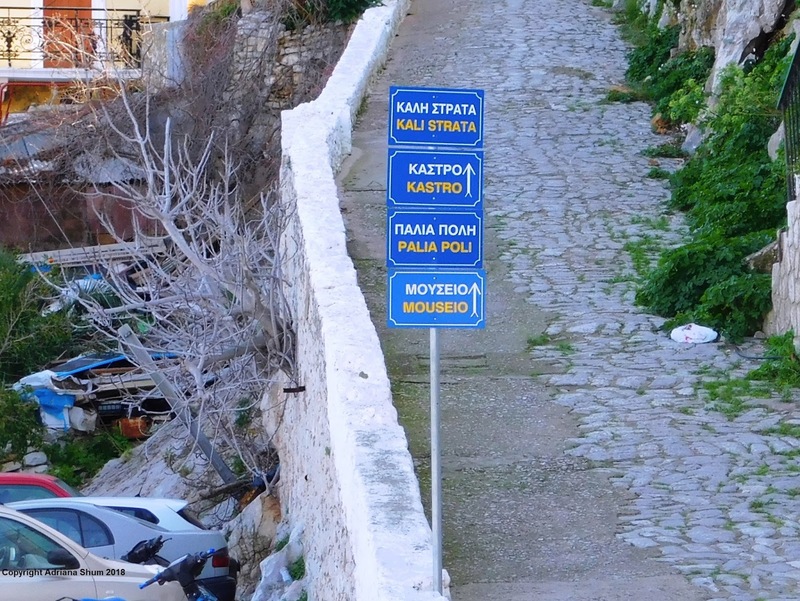 Next Monday is Clean Monday, the first day of Lent in Greece. Traditionally celebrated with picnics in the countryside and the flying of kites, everyone is keeping a close eye on the weather forecast to see what will come our way this time. It is amazing what cats will find comfortable to sleep on. Rural or urban? 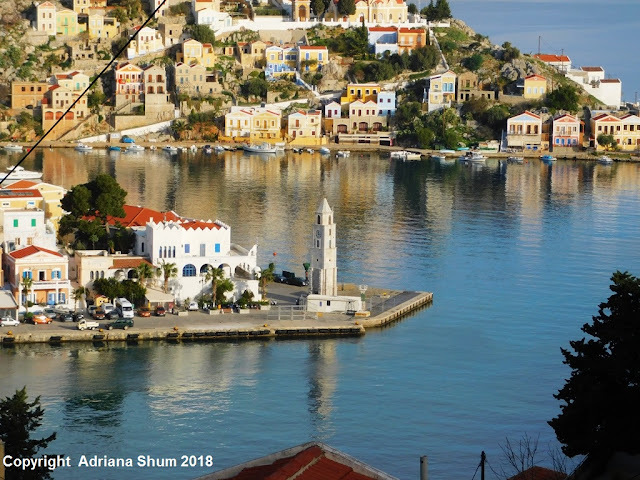 On Symi the distinction is not clear and never more so than in the winter months. Any bit of grazing will have a sheep, goat or donkey grazing on it. These two were munching away in the lanes of Chorio. Nature has planted her own garden in this old dry stone wall near the Chorio car park. There must be a story to this. That is a plastic water tank. 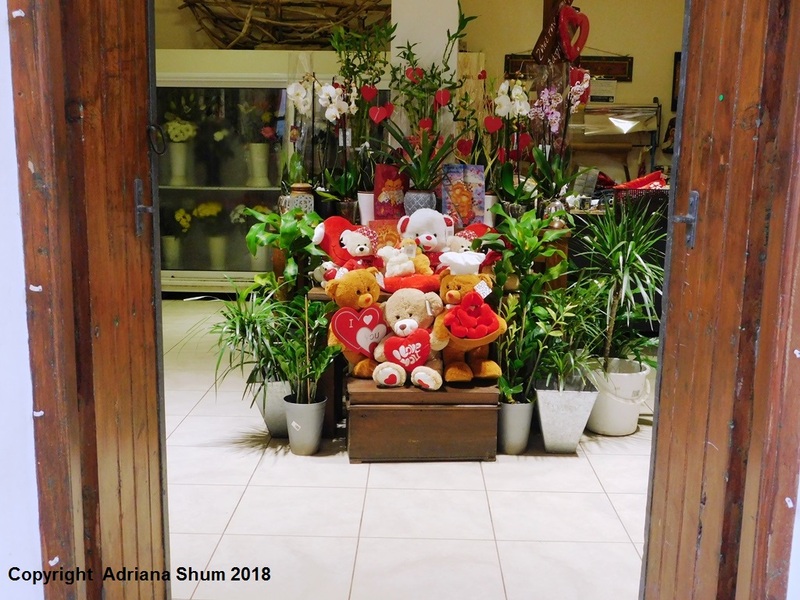 A gentle reminder from the Symi Flower shop that it is Valentine's Day next week. 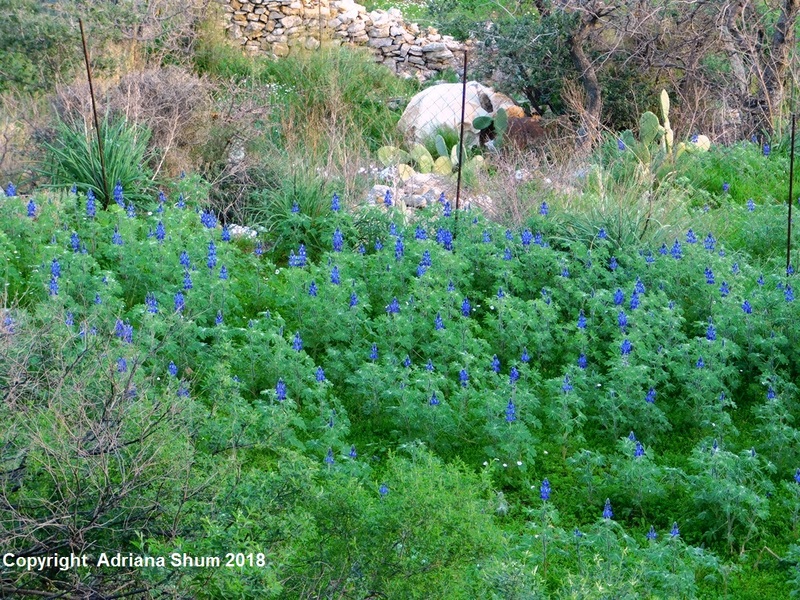 Wild lupins. 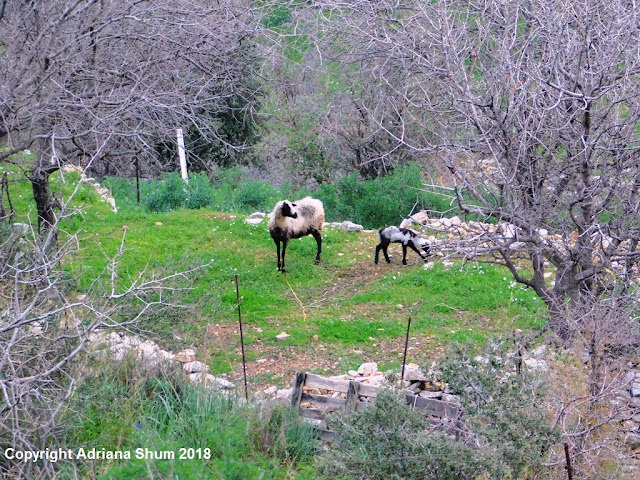 I photograph them in this field at the top of the Pedi valley every year. When I was sailing we used to call this a mackerel sky as the clouds look a bit like fish scales. It usually means that there are strong winds to come. It is calm enough now but tomorrow could be windy again. We seem to alternate between dead calms, squalls and unforeseen gales precipitating shipping bans. Looking down at the clock tower and Harani from my usual view point at the bend on the Kali Strata. The white structure in front of the clock tower is the Schengen customs and immigration border control point. 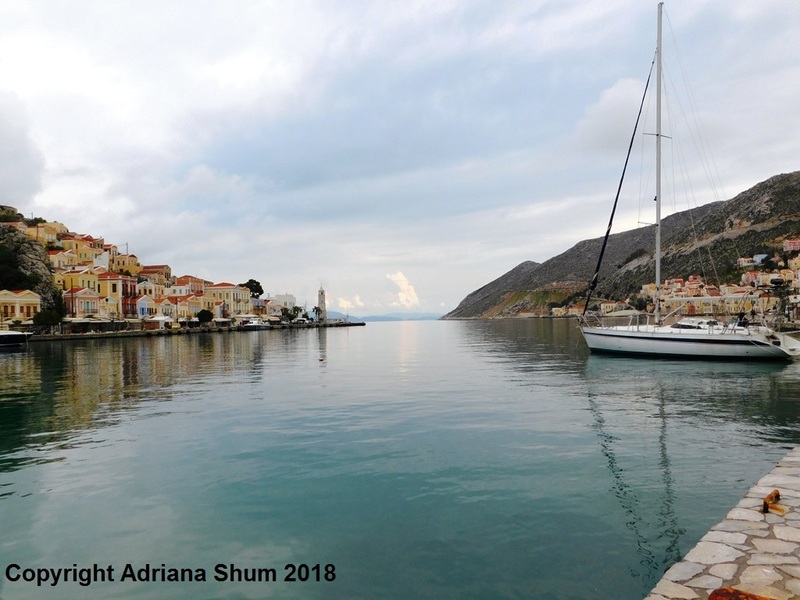 Visiting yachts, gulets and cruise ships have to clear in then before they can come ashore. 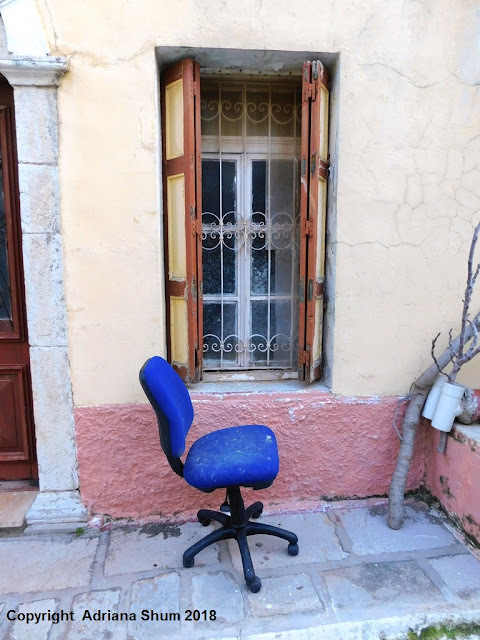 I spotted this office chair outside a house on the Kali Strata this morning. The seat is covered in ginger fur. Could this be the culprit? He didn't hang around to answer any questions. 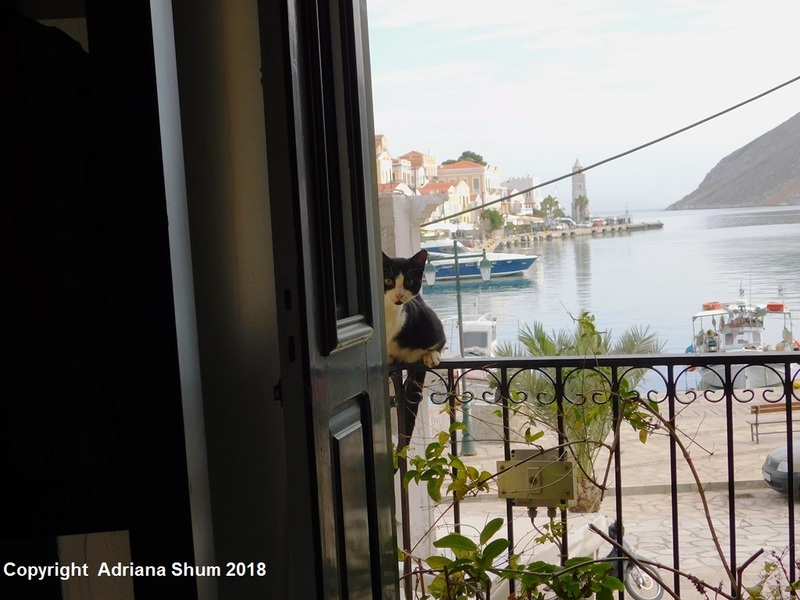 It was still enough to sit with the balcony doors open at the Symi Visitor Accommodation office this morning, to the astonishment of the cats who use the balcony railing as a bridge from one roof to the next. Dodecanese Seaways gliding into Yialos at 9.30 this morning. 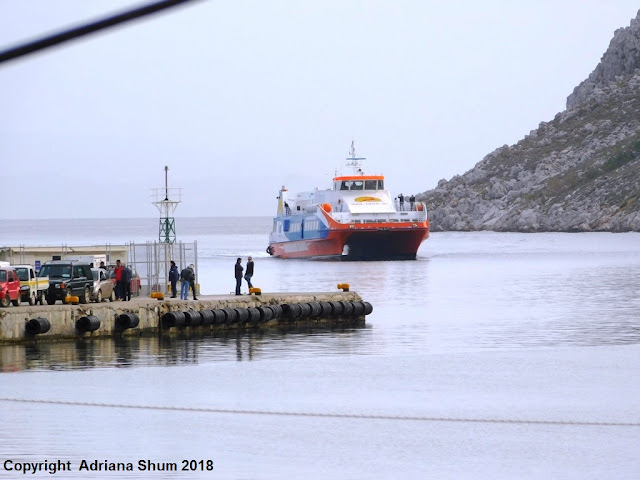 They won't be running the Symi route on Saturday as they will be catching up with the Halki Tilos route which had to be cancelled on Thursday due to strong winds. Wendy took this photograph of Pedi recently while walking Sandouri. 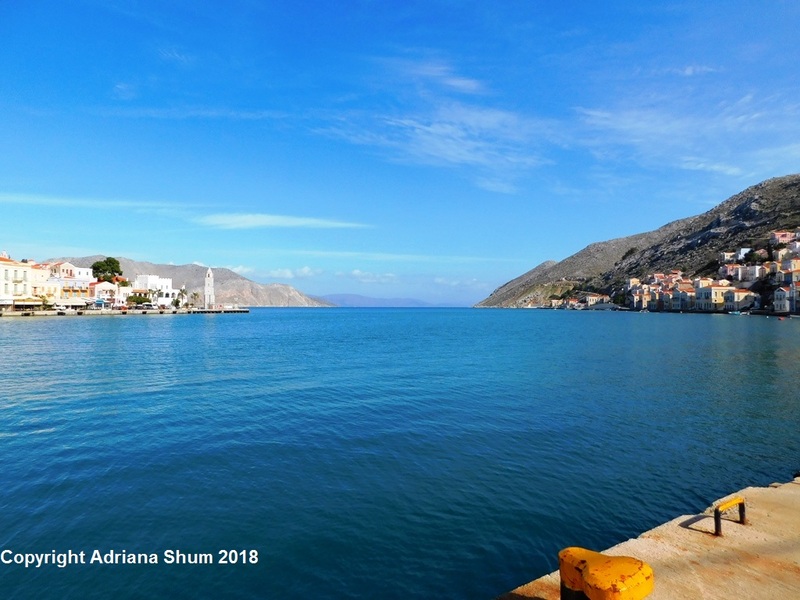 For those of you who are unfamiliar with Symi, the bump in the middle of the photograph is the Kastro, where the |Knights of St John built a castle. There was an even older fortification and church up there before that. 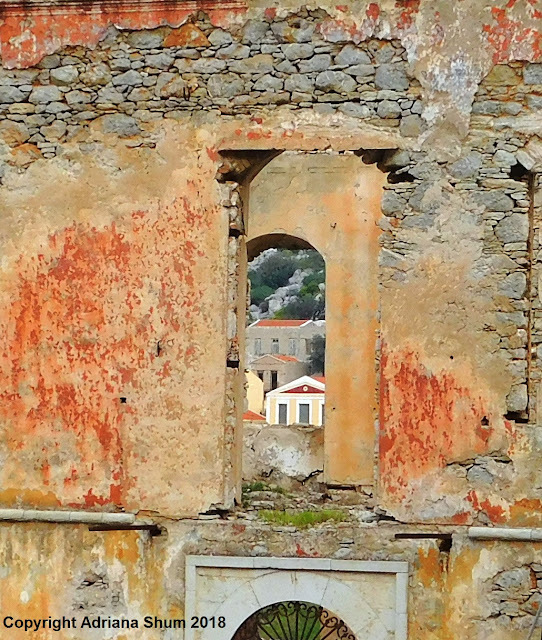 The old medieval town was clustered around its walls. There wasn't much left of the castle when the Germans used it as a munitions store during the Second World War and blew it up in the retreat, destroying many of the surrounding houses in the process. 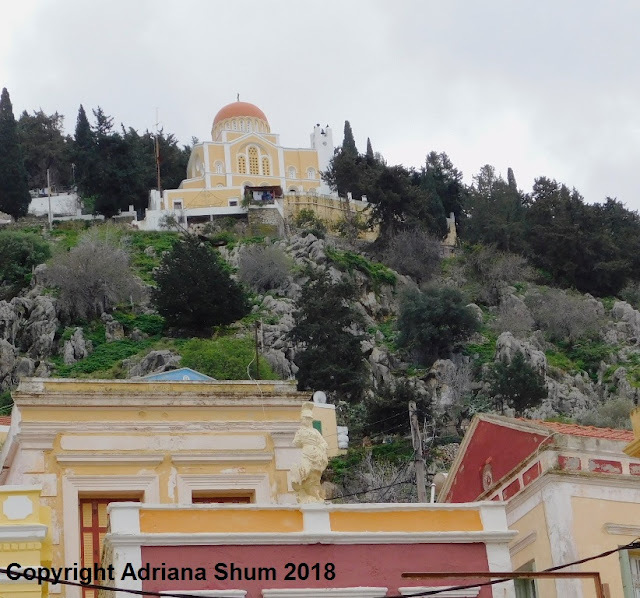 The sprawl of buildings up the slopes of the Vigla to the left of the Kastro is a very old part of Chorio, around Agia Trianda church. 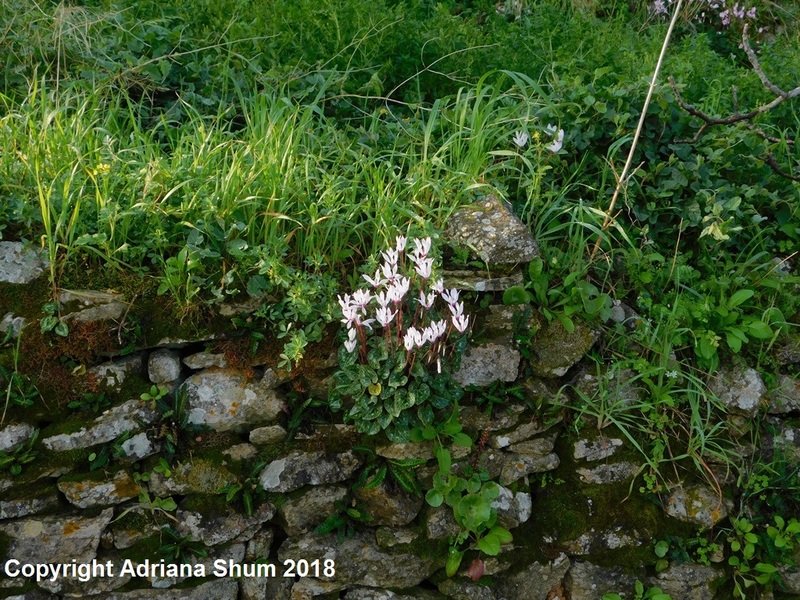 The original access to this ancient area of habitation was a footpath running from the back of Yialos, the neo-classical harbour, up behind the Kastro to Chorio. It still exists and is referred to as the Kataraktis (Cataract) as it runs up the side of a deep gorge - part of the convergence of water courses that floods the harbour in winter downpours. 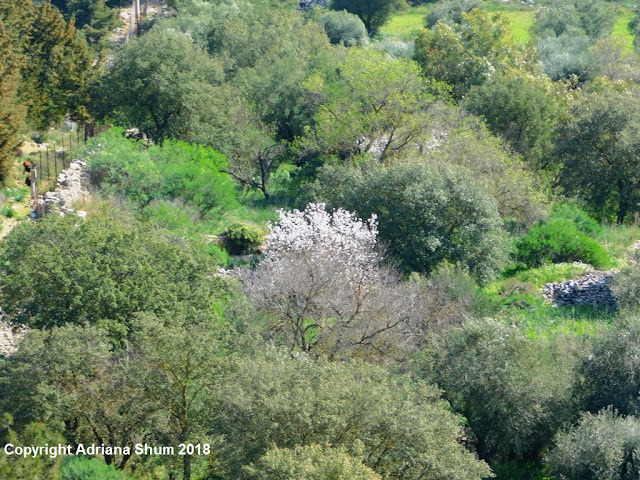 The green belt between the sea and the houses is the Pedi valley, once a major fruit and wine producing area on the island. Grey skies seem to be dominant at the moment as southerly winds bring haze and dust. 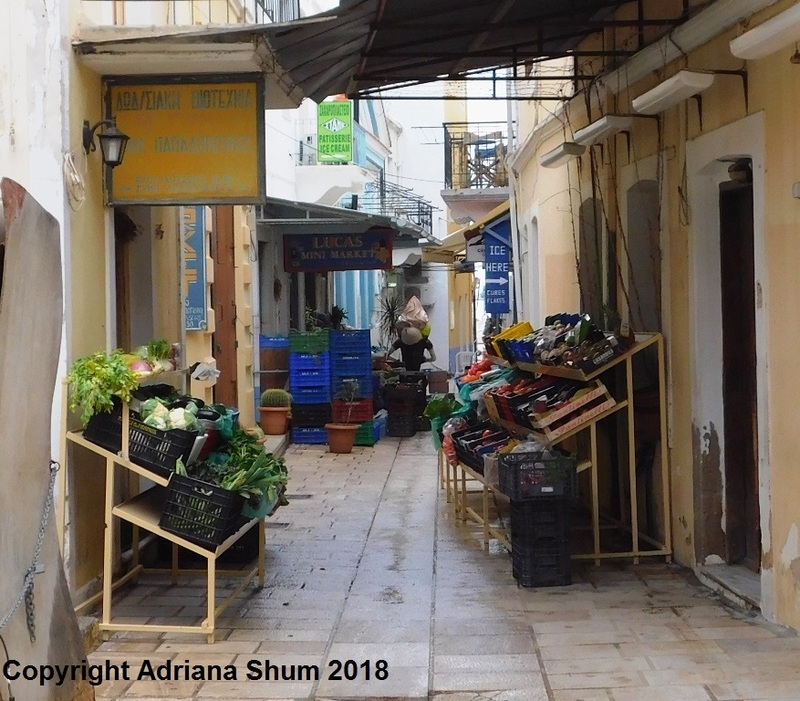 Yesterday's southerly was so strong there was a shipping ban and even Rhodes airport was closed for a while. Things are a lot calmer today and it looks as though we have a hazy, possibly drizzly, mildly windy week ahead with temperatures around 18 degrees. 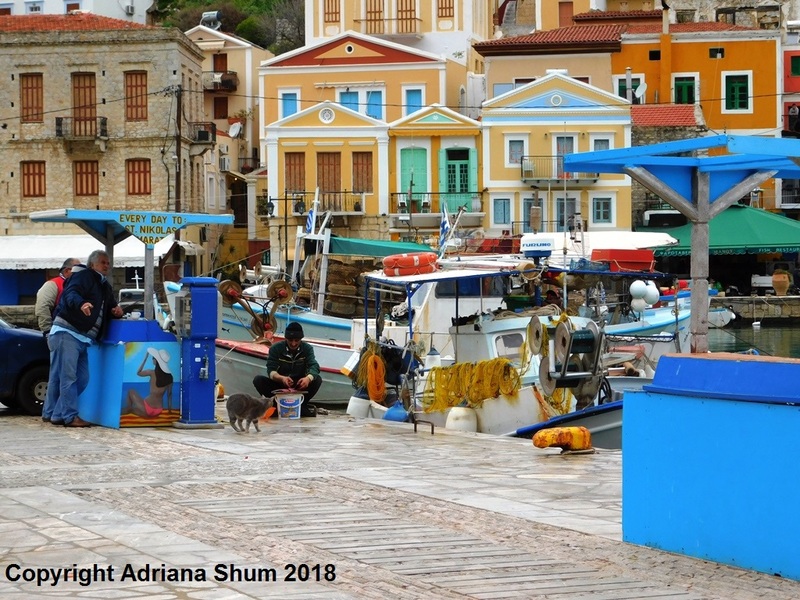 Now that the summer ferry schedules have been released by Dodecanese Seaways and Blue Star Ferries people are seriously planning their holidays. For flight tips, check Andy's travel blog. Calm seas and clear skies on Tuesday. 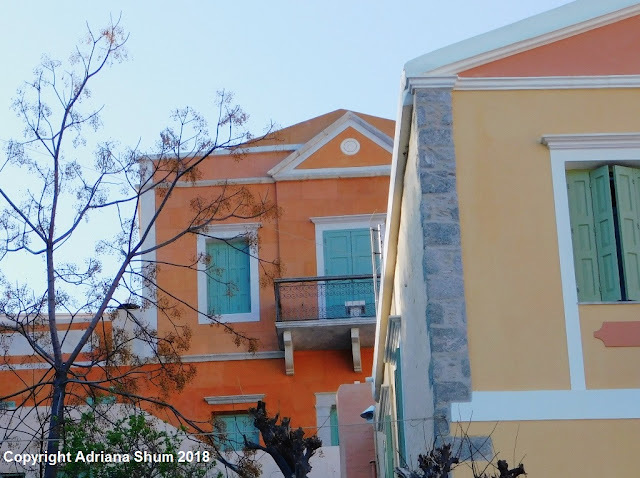 Symi neo-classical colours. 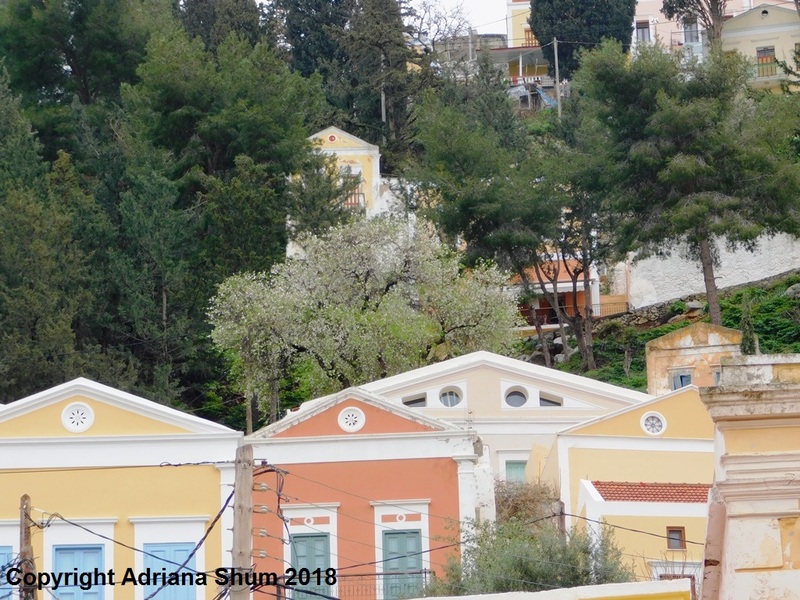 Symi's palette is quite tightly regulated, particularly in the historic neo-classical amphitheatre harbour. Walking in Lieni earlier this week I spotted this tree. 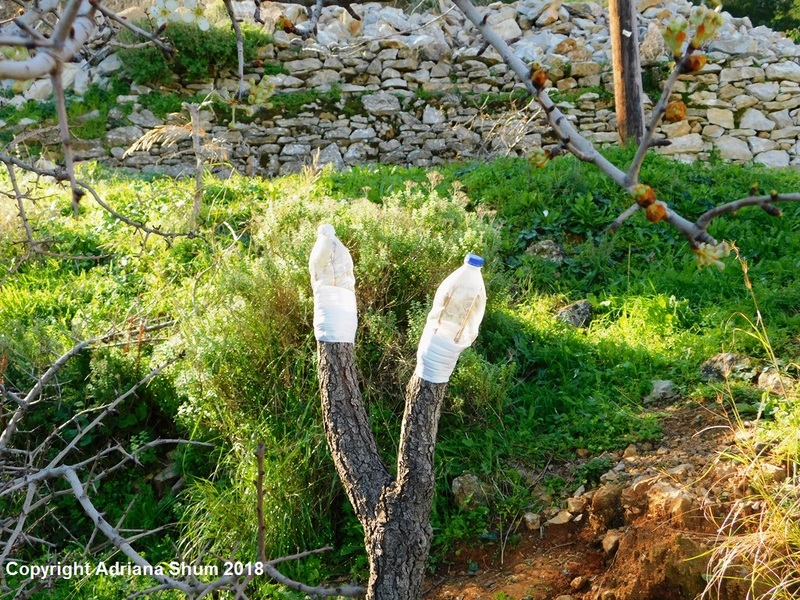 Each of the plastic bottles is protecting two cuttings which have been grafted onto the trunk. I don't know who did this but it will certainly be interesting to see if they take and what they turn into. 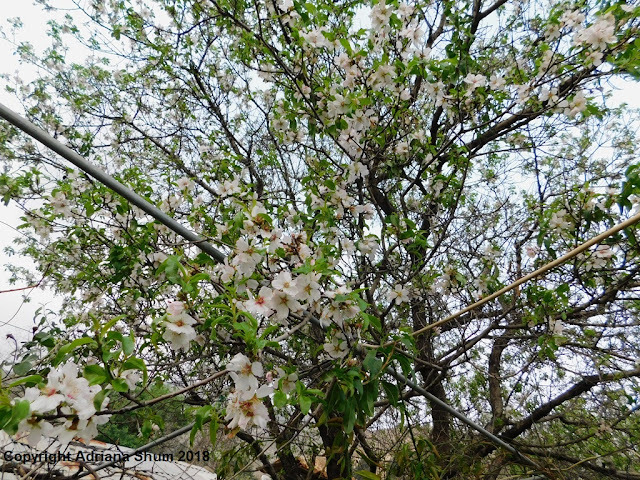 Next to the grafted specimens there is what appears to be a kind of wild pear, now hesitantly in bloom. Beware of chickens crossing roads for the next 4 kilometres? Who knows. 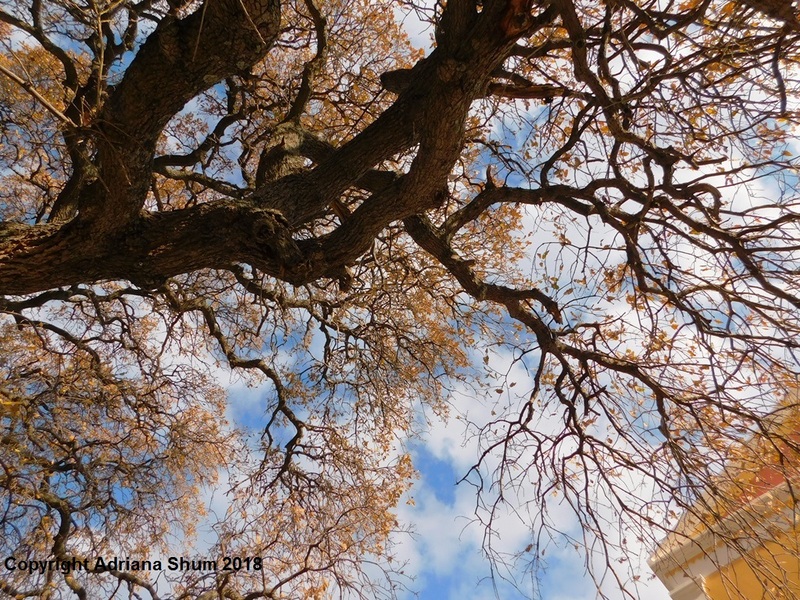 The valonia oak in Lieni has finally got the message that it should be losing leaves. Which it is doing with enthusiasm. 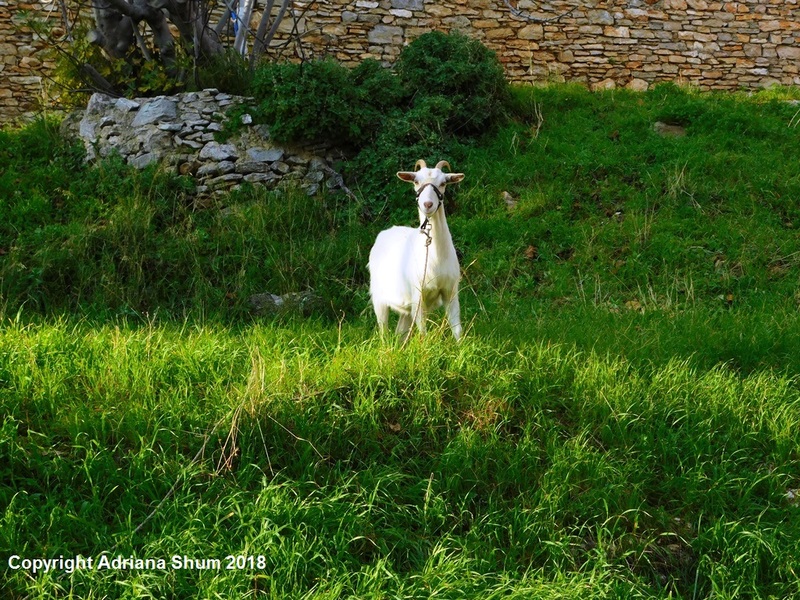 Yes, this lush pasture is on Symi. Goat's milk cheese on the hoof. The Blue Star Delos speeding past Pedi at 8 this morning. Apparently the Patmos will be resuming service in a few weeks. Although externally the two vessels are to all intents and purposes identical, the Delos is configured for short haul trips so she only has 20 cabins and a fast food franchise - not much fun it you are travelling overnight from Pireus to Symi which is about 14 hours, depending on the number of stops. The Patmos, better suited to over night passages from Pireus to Rhodes, Kastellorizon and Karpathos, has more cabins and a proper restaurant for those who don't want burgers and doughnuts for dinner and breakfast. The lambing season is well under way. This little fellow is only a few days old. It is a still dark grey day on Symi. The sky is low and poised to rain upon us at any moment. Or perhaps not. If it does, it may well be the first red rain of the year. 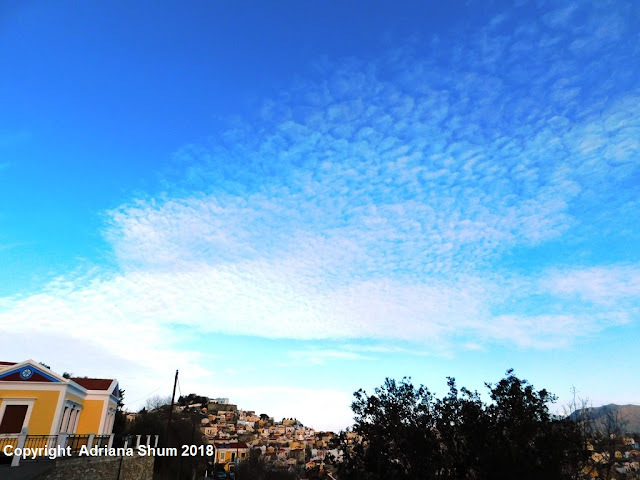 The clouds have a pinkish cast, hinting at suspended dust particles from North Africa. Temperatures are mild, with little difference between day and night - around 14 degrees centigrade at midday to 11 degrees at night. The dew starts to fall very quickly, the moment the sun disappears behind the hills. This is expected to continue for a few more days. There is a 30% chance of rain. February is always an odd month. 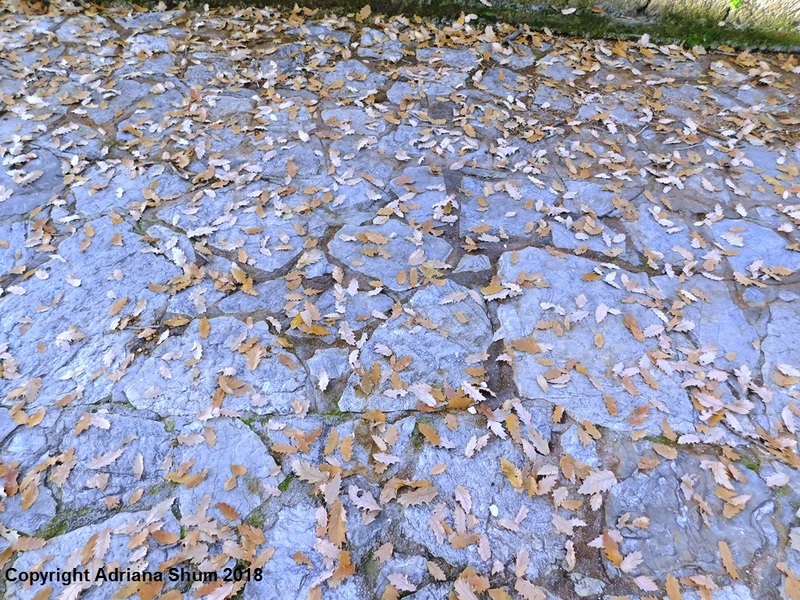 It can be extremely cold with ice on the puddles or extremely wet with no dry days or a bit of both. It is the last of the real winter months. 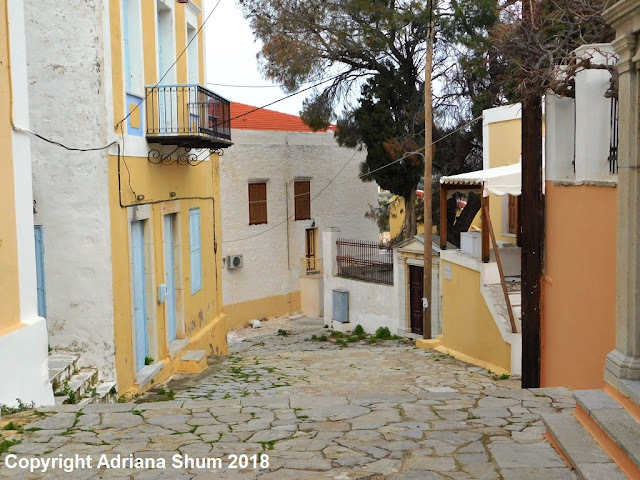 The carnival season starts this weekend with events in the square in Yialos, hosted by the local schools. Everyone is hoping for a dry weekend so that the children can show off their fancy dress costumes. While the mainland port city of Patras may have sophisticated samba girls waving feathers and jiggling their bottoms in the cold, here in the remote island of Symi carnival is for children to dress up and have loads of fun. Fairy princesses, ballerinas, super heroes, clowns and wicked witches are always popular, characters that haven't changed much in decades. The bus is still on 'holiday'. We hope it will be back on the Blue Star tonight.